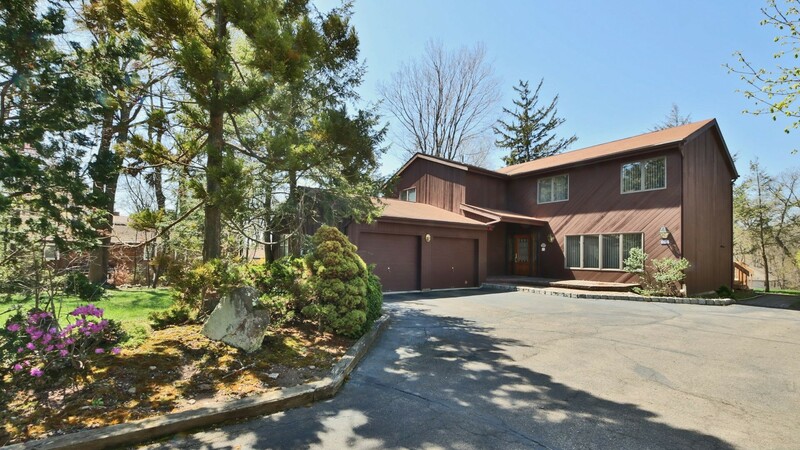 Spacious and immaculate mid-century Colonial home with 4 bedrooms and 3 ½ baths sits on a half-acre of private, beautifully maintained property in the top rated town of Woodcliff Lake. Woodcliff Lake is an amazing town with all blue ribbon schools. Pascack Hills High Schools is one of the top-rated high schools in the county. This 3,088 sq. ft. home is less than half a mile to the Dorchester elementary school and Woodcliff Middle school, less than 2 miles to the high school, close to shopping, restaurants, and the Pascack Valley train line of New Jersey Transit gets you to Hoboken/Jersey City/NYC in less than an hour. The town offers wonderful fields and ballparks for the kids to enjoy and also a state of art gorgeous town pool with picnic tables, lawn chairs, volleyball nets and all the wonderful sights and sounds of summer in a quaint idyllic community. A stone paver entry and the elegant front door opens to a light and bright foyer with tile floor and flows into a large, sun-drenched living room with walls of windows, recessed lighting, and warm hardwood floors. An oversized family room includes a fireplace, expansive windows, and enough space to accommodate all of your entertaining needs. Off the generous sized formal dining room is a spacious eat-in kitchen with abundant cabinets, counter space, and peninsula. Right off the kitchen is a light and bright sunroom for casual dining with skylights, raised ceiling and sliders to the large deck and gorgeous lush backyard. The main floor also includes a powder room, laundry room, and large foyer closet. The second floor features a huge master bedroom suite with more expanses of windows, a walk-in closet and a large master bathroom with double vanity sinks. There are 3 additional bedrooms, a full hallway bathroom with double sinks, and 2 additional walk-in closets. The basement level includes a huge recreation room with fireplace, a separate game room, a full bathroom, and ample storage area. This spacious meticulously maintained home and property with 2-car attached garage is ready to move in and enjoy!